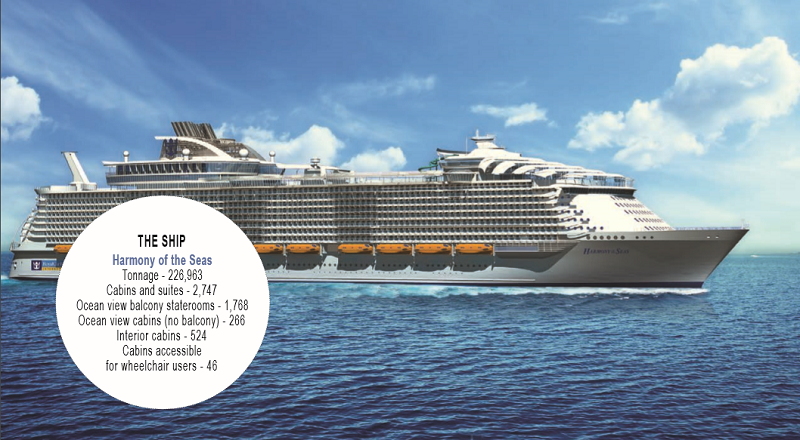 Royal Caribbean and Carnival are going large – but whose ship will win the battle of the giants? John Honeywell puts them to the test. 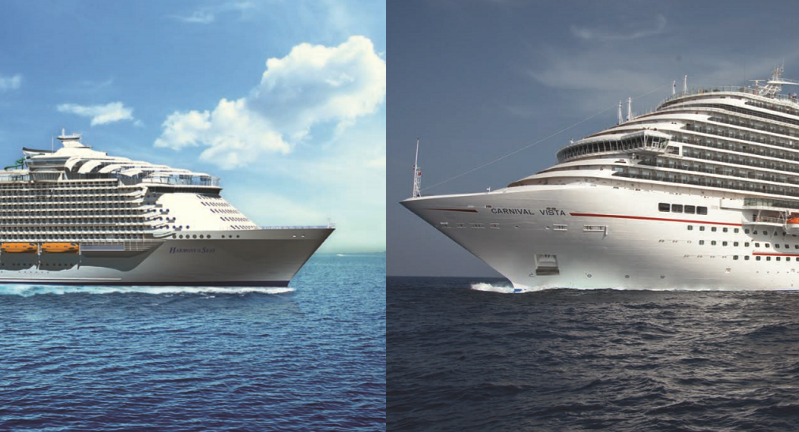 When it comes to 2016’s two newest ships in the mainstream market, size really matters. 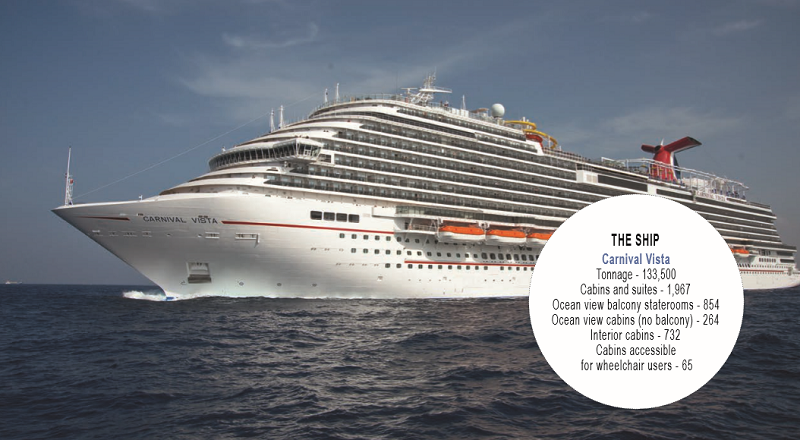 Carnival Vista is the biggest vessel ever to sail under the Carnival Cruise Lines’ flag, while Royal Caribbean’s Harmony of the Seas is simply the biggest cruise ship the world has ever seen. Launched within a few days of each other in May, both ships are packed with a dazzling array of entertainment facilities, bars and speciality restaurants, not forgetting state-of-the-art theatres, sprawling (and smoke-filled) casinos, and an ever-growing menu of other headline-grabbing attractions. Only Royal Caribbean has ships big enough to accommodate a plant-filled Central Park and a Boardwalk complete with authentic fairground carousel, but Vista prides itself on the sea-facing open deck space that adds outdoor seating to a number of eating and drinking venues. What’s more, she has an IMAX cinema that no other ship can match, and only Germany’s AIDA line can compete with her on-board brewery. Together the two ships will be taking up to 11,750 people on holiday every week throughout the year, with a combined total of 3,550 crew to look after them. Neither will be officially christened until she reaches the United States in the autumn, yet each already has a near identical twin under construction, due for delivery in 2018. Not since the days of steerage class and shared dormitories have there been cabins big enough for up to 14 people. But that’s what Harmony’s “Presidential Family Suite” provides. It’s the largest in the ship’s impressive collection of suites, which also include two-storey Loft Suites and – my favourite – the aft-facing AquaTheater Suites with their 270-degree balconies providing views of the Boardwalk, the AquaTheater (naturally) and the sea. Vista has nothing to match those in size but it has created a new concept with its Havana Cabana suites. Instead of balconies, these have patios on the ship’s broad promenade deck. It’s effectively a gated community, so occupants needn’t be concerned about nosy neighbours walking past – although they can be observed from above. Down on Deck 2, Vista also has a community of Family Harbor suites, with bunk beds for the kids, more vibrant décor – and card-key access to a lounge for relaxing and snacking. 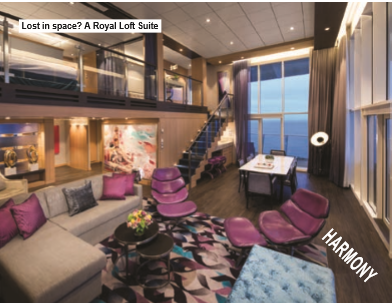 Harmony’s suite guests have their own reserved sun deck with bar and concierge service on Deck 17. On Vista, the Havana Terrace aft of the Havana Bar is reserved for suite guests during the day. Standard balcony cabins are roughly the same size internally across both ships, but the actual balconies are more spacious on Harmony. Vista’s inside cabins are consistently larger but they don’t have the virtual balconies – full-length LED screens showing a real-time view of what’s happening outside the ship – that are a feature on Harmony. Royal Caribbean offers a little more wardrobe and drawer storage than its rival, and Carnival has not managed to advance from a flimsy shower curtain – although it offers larger bath towels that will comfortably accommodate expanding waistlines. No one will ever go hungry on a cruise ship, and these two have even more choices than most. Each of the three decks forming Harmony’s cavernous main restaurant has a different name but they all serve the same menu. American Icon on Deck 3 serves dinner at set times, 6pm or 8.30pm, while The Grande and Silk on 4 and 5 cater for “My Time” dining between 5.30pm and 9pm. There’s waiter-served breakfast in American Icon, and also lunch – with buffet and waiter service – on sea days. Vista has two main dining rooms, separated by a shared galley. Both serve the same American Feast menu on elegant nights and American Table menus during the rest of the week – and they have abandoned the use of tablecloths, which some find disconcerting. The two decks Horizons, aft, accommodates Your Time Dining guests, while the smaller Reflections, amidships, has fixed seating at 6pm and 8.15pm. One unique Carnival feature is the singing maître d’, Ken Byrne – who does a passable impression of Frank Sinatra – and the waiters who dress up for a nightly singalong. Suite guests on Harmony are lucky enough to have the Coastal Kitchen restaurant, high on Deck 17, for their exclusive use. The 14ft floor-to-ceiling windows give panoramic views over the pool deck and the ocean, making this just the spot for a sunset dinner à deux. When it comes to buffet service, by making Harmony about a yard wider than her predecessors Royal Caribbean has created extra room for tables in the busy Windjammer café, and they have further expanded the space by moving the Izumi speciality restaurant elsewhere. Even at the busiest times there are rarely queues for the island serveries or for tables. At breakfast, I was disappointed to find that omelettes were pre-cooked rather than made-to-order, although my wife was successful in persuading a waiter to bring one fresh from the kitchen. 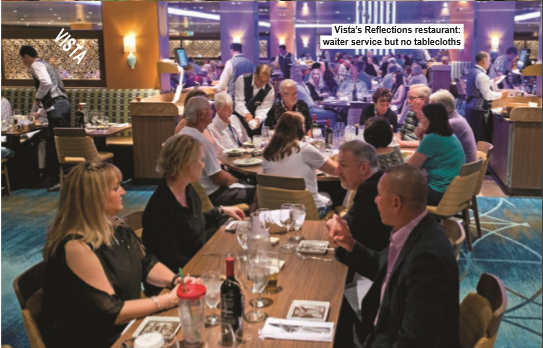 Vista’s Lido Marketplace is also well provided with tables, but queues can form at the serving lines, while passengers wanting hot food from the Comfort Kitchen might have to wait for guests in front to serve themselves with salad. There’s an all-day Deli counter making toasted sandwiches and serving hot dogs, plus self-service stations for ice cream (free) and beer ($3.95 for a glass of Budweiser). It’s burgers galore at Harmony’s Johnny Rockets on The Boardwalk. There’s usually a crowd here, with passengers prepared to pay the $6.95 cover charge, but the waiters seem too busy to provide the jive singing entertainment I’ve seen elsewhere in the fleet. Carnival has a partnership with American celebrity chef Guy Fieri, whose burger bar is on the pool deck. His special recipe meat patties are too greasy for my taste and his chips might be hand-cut but they come dripping with oil. Italian cuisine is a cruising staple, and for me – like many British passengers, it would appear – Carnival’s Cucina del Capitano has the authentic edge over Royal Caribbean’s partnership with Jamie Oliver. Perhaps we Brits are less excited about dining in a restaurant that might be on any high street back home. And Vista offers better value – the cover charge for dinner at Cucina is $15, against $25 for Jamie’s Italian. At lunchtimes, Cucina serves pasta dishes for no extra charge; lunch at Jamie’s is $20. For keen carnivores, Chops Grille serves prime steaks in prime position in Harmony’s Central Park. Cover charge is $39 and the lobster and some dry-aged steaks cost more on top. Fahrenheit 555 ($35), amidships on Vista’s Deck 5, has outdoor seating which can be brought into play on mild evenings. Asian options abound on both vessels. Harmony serves sushi (à la carte pricing) and cooks teppanyaki style ($35 or $40) at the Izumi Hibachi and Sushi restaurant buried on Deck 4. Vista’s Bonsai Sushi restaurant (à la carte pricing) is the busiest specialty dining venue on the ship, while JiJi’s Asian Kitchen ($15) is one of my favourite restaurants anywhere at sea. At lunchtime, JiJi’s transforms into a Mongolian Wok stir-fry venue (no extra charge). 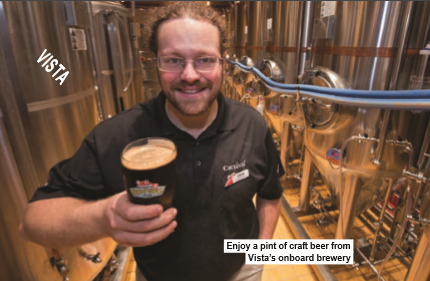 Vista scores highly when it comes to drinks, with its own micro-brewery producing three varieties of (highly acceptable) craft beer. The ThirstyFrog Rum Bar and the BlueIguana Tequila Bar by the pool have their fans, and the Havana Bar is a popular party venue in the evenings. The Atrium Bar is dominated by the three-deck high Dreamscape, an extraordinary funnelshaped LED bar displaying an everchanging variety of images. The Alchemy Bar serves a variety of cocktails but is on a busy walkway so it’s hardly a relaxing venue. Smokers congregate in the Casino Bar, and you might expect sports fans to gather in the SkyBox Bar, but I hardly saw any during my time on board. Harmony has adopted the Bionic Bar robot cocktail mixers who debuted on Quantum, and they remain popular among those who don’t mind waiting for a drink. But I have yet to see the point of the Rising Tide, which makes half-hourly journeys between the Royal Promenade and Central Park – I would rather sit down for a glass of wine in Vintages, or a beer in the Boot & Bonnet pub. West End and Broadway producers are envious of the facilities offered by Harmony’s 1,400-seat Royal Theatre. Grease is the showcase production, and there’s also a musical comedy about the adventures of Christopher Columbus’s little-known cousin, Marvin. Last-minute technical difficulties prevented me seeing The Fine Line in the ship’s AquaTheater, but I was hugely impressed by 1887, the ice dance spectacular in Studio B. Reservations for the shows can be made at screens throughout the ship, or by using the Royal IQ smartphone app. The Royal Promenade is the venue for street parties and interactions with DreamWorks characters, and Dazzles is the place for dancing. Vista’s Liquid Lounge sadly fails as a theatre – the lower level is a flat-floored auditorium because it has to double as a dancefloor, while the upper tier has poor sight lines – and the jukebox musicals which form the backbone of the entertainment are far less ambitious than those on Harmony.There’s much more fun to be had at late-night singalongs in the lively Piano Bar, or with the visiting comedians in the Limelight Lounge, who perform family shows early in the evening and turn the air blue late at night. Star attraction on Vista is the IMAX cinema – the first of its kind at sea – showing new-release Hollywood blockbusters and wildlife documentaries. The 4D thrill theatre also shows a selection of late-night scary shorts. The Ultimate Abyss on Harmony is the tallest, scariest slide at sea – remember, it’s not a waterslide but a pair of dry slides that you ride on mats. It was created by the same team that added a giant slide to the Orbit sculpture at London’s Olympic park. Both ships have water parks and water slides – on Harmony there’s The Perfect Storm trio of Typhoon, Cyclone and Supercell, as well as Splashaway Bay for smaller kids. 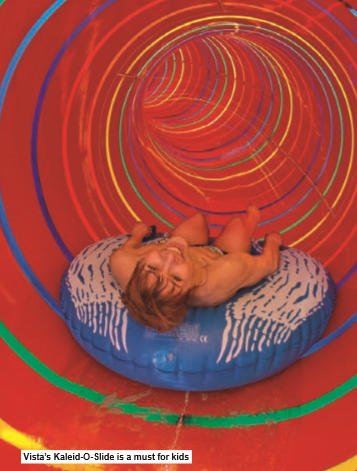 Vista has its Waterworks park and Kaleid-O-Slide, plus a SplashZone for the youngsters. SkyRide is a rather sedate suspended bike ride on Vista, and its twin tracks can’t cope with demand at peak times. The ship also has an outdoor ropes course and an indoor Clubhouse with mini 10-pin bowling. Both ships have miniature golf, but only Harmony can cater for adrenaline junkies who want to surf on the two FlowRiders or tackle the two climbing walls. The Solarium, at the front of Harmony, spreads over three levels and is a part-covered peaceful haven for over-16s. There are hot tubs and lounging beds, and a healthy-eating bistro. Serenity Deck on Vista is restricted to adults only, and also has hot tubs, cabanas and a salad bar. Vista’s Spa and fitness centre are on Decks 12 and 13, with great sea views for those whose idea of fun is pounding a treadmill. Harmony has buried its gym and spa on Deck 6, which might be convenient for the Deck 5 jogging track (2.4 laps to a mile) but cannot compete in terms of views.